Nate Caplan layers on color. Busy days of summer are coming to an end, and it's time to get back into making art! 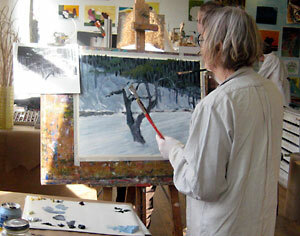 River Gallery School of Art in Brattleboro is enrolling students of all ages in Fall studio classes. 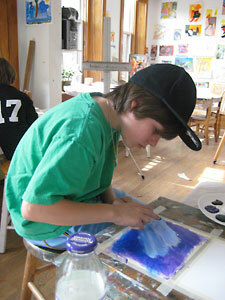 The school focuses on nurturing the creative spirit, while providing techniques and skills to students of all levels, from real beginners to working artists. Most classes start the week of September 20, except for a new offering, Landscape and Visual Memory with Jason Alden, starting September 7. The fall schedule includes two Printmaking classes, both beginning the week of the 20th. Helen Schmidt's Richly Layered Printmaking class, on Monday evenings, includes traditional printmaking techniques as well as photo-transfer and scrap-metal printing. Kim Hartman Colligan teaches a Non-Toxic Printmaking class on Thursday mornings, exploring mixed-media techniques based on monotype techniques. Schmidt is also offering a Sculpture class on Friday mornings, exploring 3-D work in wood, soapstone, clay, metal, plaster, and rice paper. In Art and Meditation, with Barbara Campman, meditation opens new ways for creative energy to manifest. Jason Alden is teaching a new course in Landscape and Visual Memory on Tuesdays, as well as Life Drawing on Mondays and Observational Drawing on Wednesdays. Matthew Peake teaches a Thursday evening course in Life Drawing and Painting this semester as well. Also on the Fall roster is a relaxing and non-judgmental class, Wicked Basic Drawing with Ross Smart. Studio Art class, in which projects are developed individually with teachers based on each student's interests and needs, has numerous weekly sessions for children, teens, and adults. 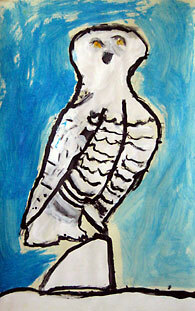 Materials provided include oil, acrylic, watercolor, pastels, and charcoal. The Sequencing approach to oil painting, developed by Ric Campman at the school, is often used. Instructors in the Children's Studio classes include Campman, Schmidt, and Ezra Stafford. Adult Studio teachers are Lydia Thomson, Schmidt, Alden, and Peake. Thomson will also hold Independent Study sessions, a small group lending critical eyes in a supportive setting for artists working on their own. Teen Portfolio and Teen Studio, on Fridays with Schmidt and Campman, focus on observational drawing and painting as well as abstract work. Collin Leech provides fun, mixed-media projects every Tuesday for seven weeks in the class Exploration in Art for Pre-Schoolers. RGS also has a full schedule of workshops this Fall and into January. In October, Found Object Sculpture with Ezra Stafford is fun for all ages. Ralph Deanna teaches two different types of workshops: Autumn Landscape in October and Nightscapes in November. Also in October are Sequencing with Lydia Thomson, Lost and Found Mosaics with Richard Youngstrom, and Pastel Under-Painting Possibilities with Matthew Peake. Our free community Sketch Crawl event is on Saturday, October 23. A Life Drawing Marathon and Angels, Beasts, Shepherds, & Kings workshop with Barbara Campman are in November. And finally, in January, Susan Bonthron teaches Travel Journaling, a bookmaking workshop. River Gallery School is a non-profit educational organization that offers an in-depth visual arts program for young people and adults. Please visit our sunny downtown studios at 32 Main Street, second floor; check our website, www.rivergalleryschool.org; or call the office, (802) 257-1577, for more details.